If your pet has excess body fat, it has additional weight to carry. This in itself has a lot of bad effects because it is harder for them to move around. It also makes life more uncomfortable for them. Even simple daily routines such as sitting and lying down become less comfortable when your pet becomes overweight. Because it is harder to move around and over-all life is uncomfortable, your pet becomes less active. This will increase the chances of gaining more weight, which creates a vicious cycle. This is one of the reasons why many disabled pets suffer from weight gain problems, which is why you should monitor and manage your pet’s weight. First, find out if your pet is actually over-weight. Use a body condition chart to find out if your pet is at a healthy weight level. If your disabled pet is over-weight, start monitoring and managing your pet’s nutritional intake and regular activities. The key is to balance food intake and food burning activities energy. You must find the right balance so that your pets food intake is a little but less than the food burning activities. Again, this is exactly why it is more difficult for disabled pets to keep to a healthy body weight level. Lack of mobility means less food burning activities. this is where you come in to help your disabled pet maintain a health body weight level. To help your pet lose that excess weight, establish the amount of food your pet eats daily. Monitor the amount of food your disabled pet eats based on weight and not on portions. This will give you a more accurate way of monitoring and managing your pet’s food intake. When you have established the amount of food your pet eats daily, start to gradually reduce this amount. It is very important to do this gradually. A sudden or abrupt loss in weight could create more health problems for your disabled pet. A good rate of weight loss is a maximum of 2% of actual weight per week. If the percentage of weight loss goes higher than 2% per week, gradually increase the food you give your disabled pet. Continuously monitor your pet’s weight and continue to gradually lessen the food intake until your pet reaches the ideal body weight. When this happens, maintain the food intake. Continue to monitor your pet’s weight even after they reach their ideal healthy body weight. If your disabled pet loses too much weight or becomes over-weight again, adjust the food intake accordingly. It will also help if you can get your pet moving more. Obviously, that’s a little harder when your pet is physically disabled, but with the right mobility aids, it should be doable. 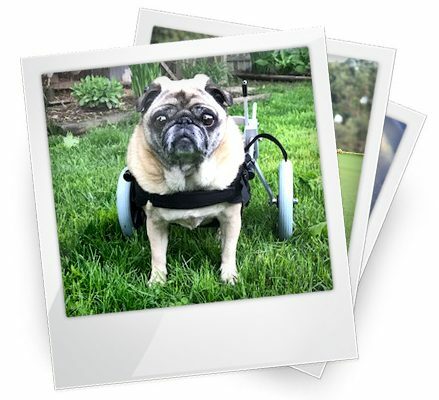 The best way is to take them for daily walks using the appropriate wheelchair if your pet still retains mobility in either front or rear legs. You can also bring them for regular exercise in a swimming pool or a rehab center. Regular exercise will not only increase their activity levels, but also their quality of life. It may also be a good idea to give your disabled pet food supplements. Ask your vet what supplements are beneficial for your pet’s health.